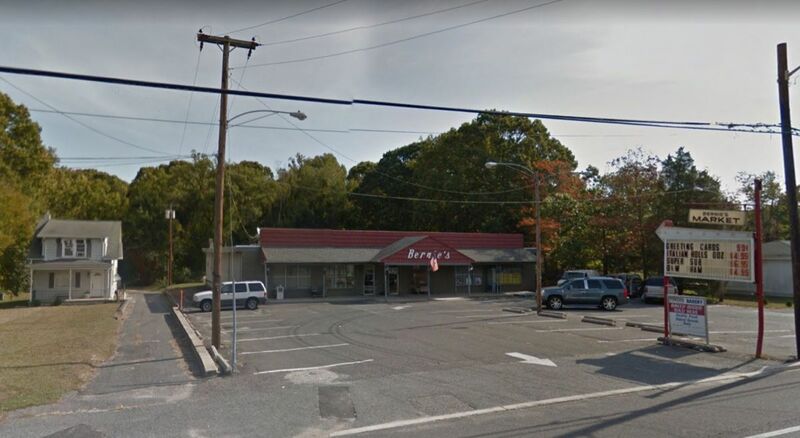 The rumors of a Super Wawa coming to the 5-points intersection (bordering Washington Township and Deptford) have been swirling for years, with several of the well known intersection properties tossed into the mix. This information is based on a real estate posting by CBRE real estate. Thinking a little outside the box.. the new Super Wawa (and other stores!) will be moving into an undeveloped plot of land where Blackwood-Barnsboro Road bends out to connect with Egg Harbor Road. The planned development will need to take a decent portion of County House Conservation (Mulch) property which will offer room for additional stores! 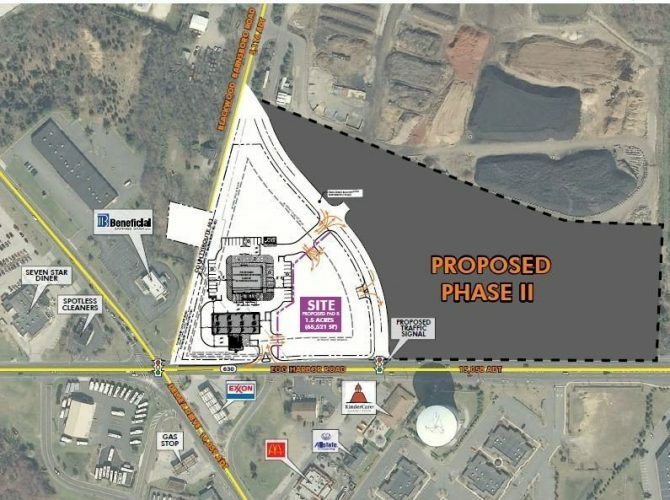 The “outside the box” part of this is… to provide enough room for the Super Wawa, they plan on moving the Blackwood-Barnsboro Road bent connection down even further on Egg Harbor Road… to be almost in line with the water tower and across from Kindercare. The new Super Wawa store will basically sit on the current roadway. The Phase 1 siteplan includes a Super Wawa with Gas pumps, and room for another smaller pad site. Then to take advantage of the frontage on heavily traveled Egg Harbor Road, the developer is planning a Phase II with additional development down the road which could down as far as (across from) the shopping center where the Village Pub is. The developer is proposing a new traffic signal at the new intersection of Blackwood-Barnsboro and Egg Harbor Road. A portion of this property was previously approved for a liquid propane gas station, which obviously wasn’t developed. Overall I feel this is a great location for a Super Wawa, as for miles down Hurfville, Rt 47 and Egg Harbor Road… there really isn’t any Wawas or Royal Farms stores, so this new Super Wawa should pull from a wide area for the morning commute as this large area heads towards 55 and 42 on the way to work. I live a little bit down the road in the area of South Jersey Credit Union and I am a daily visitor to Deptford’s Wawa on Hurfville Rd… and at this time I don’t know if this will impact the existing Wawa. I did notice that the previously closed “Classic” Wawa at 5 points which has been operating as another brand store is up for sale now… maybe they heard about the new Super Wawa coming. I’m very excited to have a Super Wawa close by my home. My neighborhood is located in an odd area… in that even though we are close to both the Mall and Outlets, it seems a high quality drug store and gas station really isn’t close. But I will hold back on my excitement… considering they need to move a road to accommodate the development, the added necessary government approvals is going to drag this out even longer, and the convenience store development process just doesn’t seem speedy in normal conditions. Jay Miller of CBRE is listed and the project agent. The project listing and contact information can be found here. Wenonah/Deptford's long beloved Bernie's Food Market will see new shoppers again, as Dollar General has plans to remodel and expand the store building. 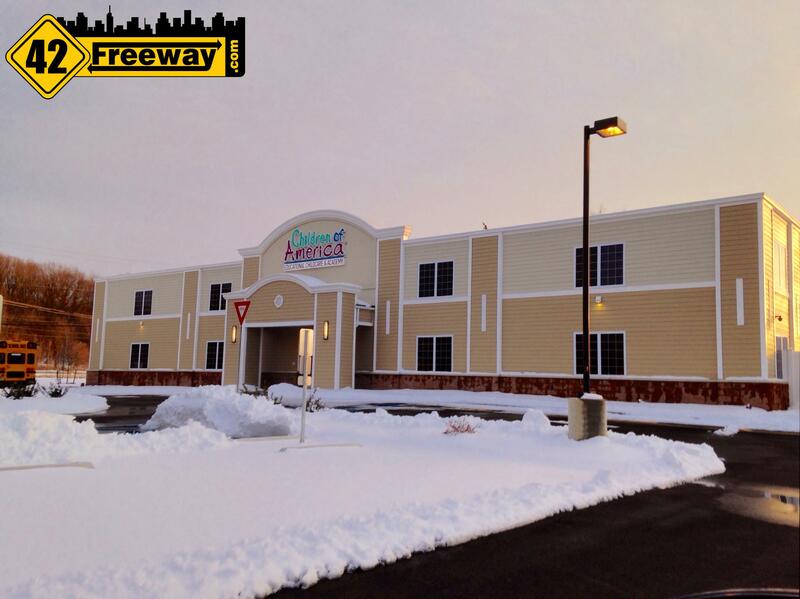 A completely new and large day care center is ready to open its doors, and they are holding an open house on March 28th. Children of America is a large chain of educational child care faculties, and its new location has been built from the ground up on Barnsboro Rd in the Sewell area of Washington Township. Hopefully they put the Exxon out of business. Like most Exxons, they are constantly at least 20 cents more expensive than other nearby gas stations. That intersection is really congested now. Can’t imagine how much worse it could get. I certainly hope that they plan to beef up the 5 points intersection, i.e. 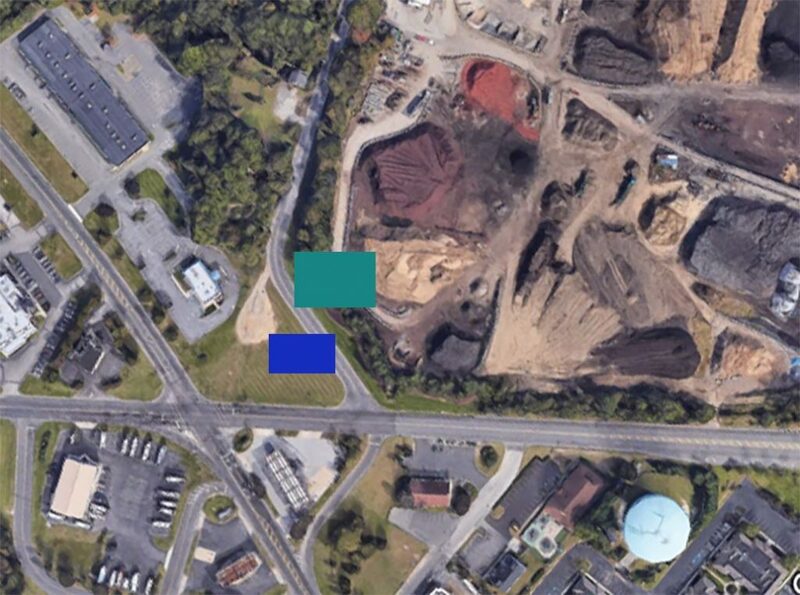 Egg Harbor gets left turn lanes and left turn signals in both directions; They widen Egg Harbor Road to at least 3, long lanes on either side of the intersection to support the new left lanes and they smooth out the paving going south across the 5 Points Intersection. This whole intersection is a kludge as far as traffic flow and road surface condition! This needs to be fixed to support the increased traffic that the new WaWa (and whatever else) will generate. I hope that part of the project is repairing the Deptford side of Egg Harbor (beween RV and Cleaners) because that road is horrible and ruining suspensions and tires daily. That Exxon will most likely close up shop and then we’ll have another vacant property there. I’d like to see how they propose to fix that intersection with Delsea and Egg Harbor. An extra turn lane all the way back to the old WaWa would be helpful on Egg Harbor and eliminating that cut through behind the Exxon would be good as well. Of course to offset there needs to be a turn lane on Delsea on to Egg harbor at the light or at the McDs. NO MORE WAWAs!!!!! NO MORE WAWAs!!!!! NO MORE WAWAs!!!!! NO MORE WAWAs!!!!! NO MORE WAWAs!!!!! NO MORE WAWAs!!!!! NO MORE WAWAs!!!!! NO MORE WAWAs!!!!! NO MORE WAWAs!!!!! NO MORE WAWAs!!!!! NO MORE WAWAs!!!!! NO MORE WAWAs!!!!! NO MORE WAWAs!!!!! NO MORE WAWAs!!!!! NO MORE WAWAs!!!!! NO MORE WAWAs!!!!! NO MORE WAWAs!!!!! NO MORE WAWAs!!!!! NO MORE WAWAs!!!!! NO MORE WAWAs!!!!! NO MORE WAWAs!!!!! It’s just getting ridiculous now… you can’t drive two miles down any major road without passing one. 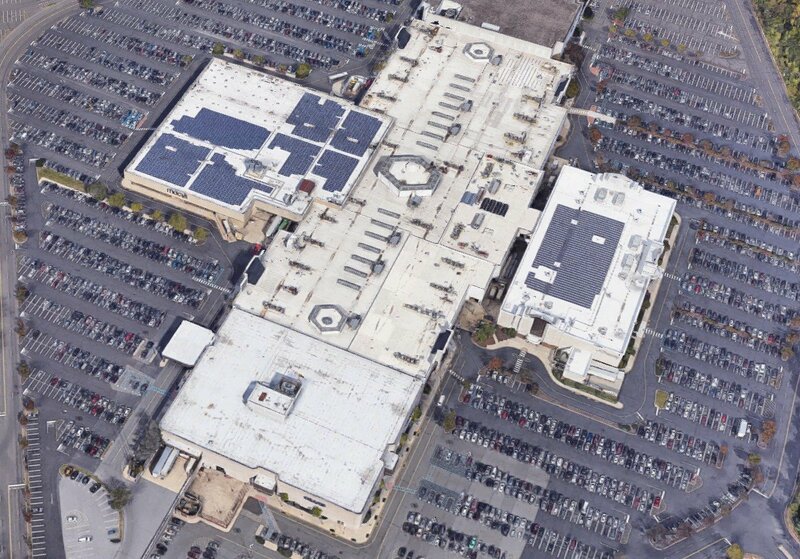 Local leadership needs to start rejecting them, just as they’ve rejected WalMarts in the past.